Comics play a great role in popular culture. A basis for movies and videogames, comics characters become iconic examples to be followed. A question arises – how did these drawn stories became so popular? How did it all began? Let’s try to explore the periods of comics history. Well, first of all, historians do not have a single opinion on the periods of comics history. Especially on the ancient times, the origins of comics. According to one version, their progenitors were Japanese monks, who draw pictures with short signatures on rolls of paper. Next stop: medieval Europe, where collections of pictures on colored paper played a religious role. They depicted the life of saints and glorious rulers. A bright example of this is the Bayeux Tapestry (XI century), telling the events leading up to the Norman conquest of England and culminating in the Battle of Hastings. Another example are the Mixtec codices. Handwritten documents of native tribes from Central America of the pre-Hispanic and colonial age. One of the oldest exemplars in terms of periods of comics history. 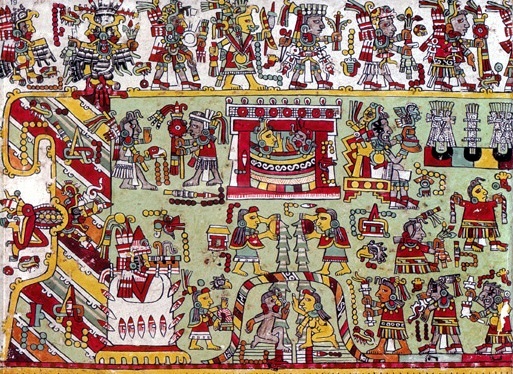 The codices illustrate historical and mythologic events in a pictographic form. But are these manuscripts rightly considered the ancestors of comics? Do they have enough background to be listed in the periods of comics history? To answer this, let’s first determine the main components of a comic book itself. First of all it’s the graphics. A series of illustrations united by a single story. Second – the text which matches the graphics, explaining and enriching them. Both the European medieval manuscripts and Mayan codices correspond to these criteria. They depict either the lives of saints and rulers, outline the major milestones of folk mythology, history and genealogy of the main dynasties. So we see that even these pieces of art, quite far from the modern image of comics, still bear all the main features of the genre. This allows highlighting comics as a separate niche in art and explore further the periods of comics history. The genre has acquired an almost familiar form with the beginning of mass production. One of the earliest was “Little Bears” by James Guilford Swinnerton, published in “The San Francisco Examiner”, 1892. This was the first comic strip ever. At the same years in Épinal (France) more than six hundred stories are printed. 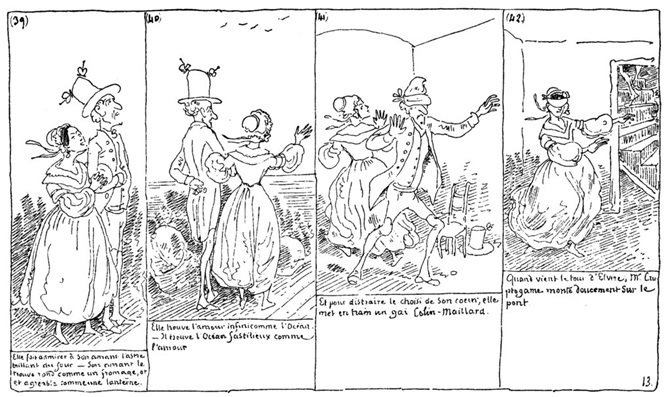 Starting from 1830, the French artist and writer Rodolphe Töpffer publishes a series of albums about the adventures of Mr. Jabot. Making the comics genre more and more popular. Fairytales are being adapted into comics. Some newspapers make a weekly column specially for comics. When all this comes to the US – things start to get serious. Some characters become nation-wide favorites, comics are literally swept from the counters. The genre is evolving into something greater than purely humoristic strips. More and more frequently they become enriched by political satire, philosophical reflections and a branched complex storyline. In 1929 in USA the first all-comics magazine appears: “The Funnies”. Moving on. In 1934 the publishing house “Casterman” is founded in France. It is still Europe’s largest publisher of comic books. 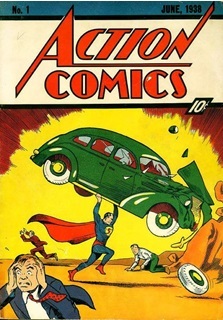 The famous DC Comics appear in the US, and in 1938 they publish the first issue of Action Comics, where readers are introduced to the character that was to later become iconic: Superman. This event marks the beginning of the Golden Age of comics. Perhaps, the most sparkling and ecstatic of the periods of comics history. The age of almost-gods. The birth of a new mythology. 1939: Marvel Comics are established, temporarily under the name “Timely Comics”. Suspense, sci-fi, drama and the first superheroic comics flood the bookshelves. Gradually it becomes harder and harder to find someone who has never ever read a comic book. With the beginning of WWII, covers become full of superheroes fighting Adolf Hitler. A social mirror depicting people’s will to combat Nazism. Keeping up with the times, in March 1941 Marvel introduces a new character, who became a real idol of the said years: Captain America. After the war, public’s demand for brave superheroes falls. But comics are still popular! Horror comics and detective stories become a trend. These are the years when the first issues of “Tales from the Crypt” are published, later to become a best-selling series of horror stories. When the sales of “Tales from the Crypt” outperform those of “Batman”, publishing houses suddenly change their vector of development in a pretty much dramatic way. Madness engulfs comic pages. Noble superheroes give place to strange monsters, vampires, zombies and other undeads. The level of ethics falls drastically. This eventually lead to full-scale protests and, in some cities, even public burnings and bans of comic books. This was the reason behind the forming of the Comics Code Authority (CCA) in 1954 as an alternative to government censorship and regulation. 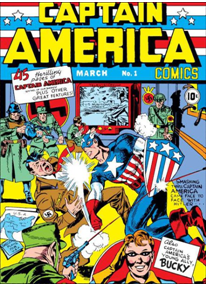 The CCA allowed publishers to self-regulate the content of comic books in the United States. Meanwhile in Japan… Manga becomes something similar to those of modern times. In 1956 Flash enters (or better… rushes into? :) the arena after five years of absence. This and the revival of a couple of other superheroes, including Green Lantern, initiates the “Silver Age” of American comics. That’s when a lot of new characters are created: The Fantastic Four, The Hulk, The X-Men, a bit later – the Avengers. Yeah, the same guys that became a basis for lots of modern movies. In these years DC Comics start to lose their grip. Productivity and sales fall, letting Marvel (under the leadership of godlike Stan Lee) rightly take the first place in the industry. Indeed, when talking about periods of comics history, this may be the apex of Marvel. In a sense, at least. Meanwhile in France… Asterix and Obelix are born! Meanwhile in England… The first appearance of Judge Dredd! Meanwhile in Italy… Nothing notable happens. Italy goes its own way, publishing tons of low-grade comic books, full of black humor, madness and violence. In 1970 the authority and importance of the CCA falls significantly. It loses its statements one after another, making it possible for lots of trash and insanity return into the comics. This is the “Bronze Age” of comics culture, characterized by a significantly more loose morale. It gives birth to such ambiguous and bright characters as Wolverine and The Punisher. Ah, the dawn of the antihero era… Comic characters take up arms, spitting obscene and cruel jokes with rising frequency. The popularity of the genre continues to rise, but now – not only among teens. Publishing houses start to actively create content for the adult auditory. The industry gets wider and deeper, taking in many new and creative authors. Making the Bronze Age one of the most intriguing periods of comics history. BAM! Most of former superheroes hit the bottom. In 1997 Marvel falls from grace right into bankruptcy. A start of a dark age, in which noir becomes one of the most popular directions. These years mark the rise of Neil Gaiman (“The Sandman”) and Alan Moore (“V for Vendetta”, “Watchmen”). 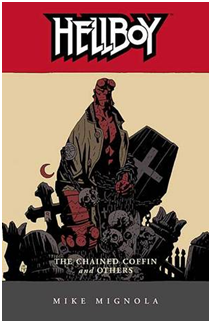 A perfect time for the masterpieces of Mike Mignola (“Hellboy”, “B.P.R.D.”) and Grant Morrison (“Grant Morrison’s Batman Run”) to be born. A perfect time for the unique touch of Warren Ellis (“Transmetropolitan”). For the emergence of Sin City by Frank Miller. The industry changes right before our eyes, and it becomes hard to tell on which side are the characters. Times of exaggerated heroes and grotesque villains have passed. The average comics-reader becomes older, the target audience changes alongside the trends in culture, the narrative of what was sometime “drawn stories” gets deeper and darker. Comics enter the modern times with a much more violent and controversial face than in the beginning of their path. The main trend of the modern era continues to be realism. In a grim and gritty manner. The major publishing houses are being purchased by media giants: DC Comics by Warner Bros and Marvel by Disney. Comics adaptations with enormous budgets become one of the key points in the movie industry. DC Comics relaunches its fictional Universe a couple of times – in 2011 and 2016. This is the most familiar of the periods of comics history, the most well-known to the general public. Well… A lot happens, but without any drastic changes in the trends or directions. Being highly varicolored, comics still managed to somehow achieve stability. For how long? Definitely, comics have grown up. Overcoming all of their natural stages of aging. The sweet infancy of short strips about lads from the streets of NY. The childhood of mighty superheroes. A violent adolescence filled with negative characters and grotesque villains. A middle age crisis of noir narrative. After such a retrospective: what is about to come? All we are left with is our curiosity, hope, anticipation. Hope for comics to remain an immortal genre of art. Surprising us again and again with new ideas, trends and manners of telling breathtaking stories. Anticipation for new and exciting periods of comics history.